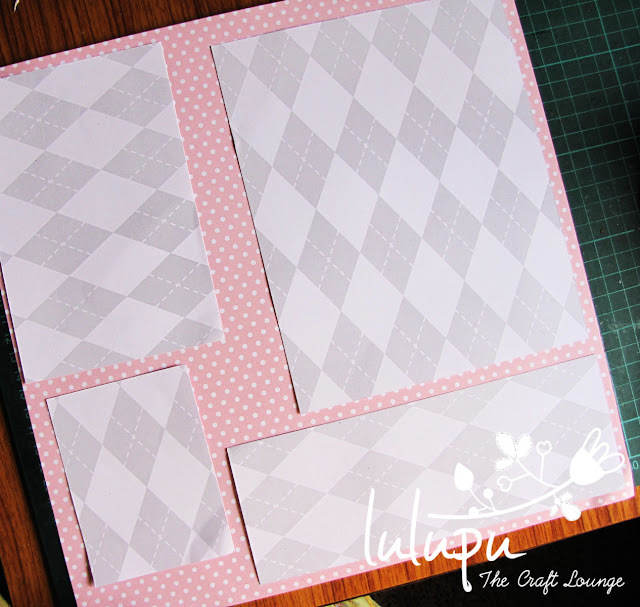 Lulupu - The Craft Lounge: My favorite month of the year 2012! As Snehal introduced the challenge yesterday, it is all about scrapping your favorite month this year and maximizing your pattern papers. There is so much you can do with pretty papers, the possibilities are endless. And I have a few "in the making" shots for this layout before I show you the final layout. I prefer to start with a sketch for my layouts and for this one I used the sketch HERE. And I also prefer to lay out all the elements of my page before sticking anything. When I am satisfied with the arrangement, I glue it all together. The American Crafts Baby Scrapbook kit made it really easy to color coordinate and bind everything together. And I have put my seldom-used punches to some use :) The flower embellishments are made from 1" and 5/8" circle punches. Here is a list of supplies used in the making of this layout. Play along this month with the layout challenge. It's a lot of fun, I tell ya !! very very pretty layout Ujjwal..and those flower embellishments are very cute..
Awww.. you look soo cute!